These are a few of my favorite things….spring flowers! Every Spring, I get out to capture flowers as they emerge from the ground, bloom, and even die back. I have almost 900 in my Spring Flower catalog and was trying to find the best one for the Nature Challenge. These didn’t make the final cut, but they are some of my favorites. We sang this song this morning at church. I had forgotten what a powerful song it is. When you sing it with meaning, from your heart, you are saying that you want more of God in your life. You are saying that you want to worship Him with all your mind, heart and soul. One of my photography projects, Hands That Worship, celebrates songs like this one. In the series, I photographed hands portraying the words or emotions of the songs. For this song, I used sign language to portray the words. It remains one of my favorite images. I enjoyed our vacation to Joshua Tree National Park in 2010. One of my favorite images was of a large Joshua Tree that was fully formed. It was also an interesting image to try different digital development styles. Which one do you like best? Such a beautiful bird! The Snowy Egret has lacy feathers and a streamlined shape that photographs so well. This bird was visiting Fisherman’s Village in Punta Gorda, Florida the same day that I was. Fisherman’s VIllage is a shopping area that has brightly colored buildings. This bird posed for me in front of this turquoise building when the light was just right. 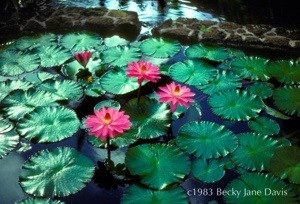 I love water lilies. Getting close enough to get a photograph can be challenging! This image is from the “old” days with my Minolta SRT101 and color slide film. It was taken on my first trip to Hawaii in 1983. I’ve always liked this image, but had forgotten about it. It sat in a slide carousel for a number of years, waiting for the chance to be seen again. I love the lighting, the water in the background, the the placement of the flowers. Looking at it reminds me of that trip to Hawaii, the sun and sea, the warmth. It also makes me want to look at those old slides from vacations “before kids” to see what other gems I can find! Butterflies have been a love of mine for years, but capturing them in photographs can be challenging in the wild. That doesn’t stop me from trying! I’ll share other butterfly images in the future, but this one is a favorite of mine. I saw this monarch as I was walking with my mother-in-law outside her nursing home on a sunny, fall afternoon. Autumn Joy goes from green to bright magenta to brown in a matter of weeks in the fall and is a favorite flower of mine. This monarch was perching on the blossom sunning itself. I was using my Nikon film camera with color slide film. I like the shallow depth of field, where the magenta blossoms in front and in back of the butterfly are blurred. I scanned this slide and print it digitally. I use this image on my business cards and for other personal uses. Torrey Pines are unique and they reflect the adversity of the winds and storms they are subject to on a daily basis. While in San Diego a few years ago, we visited Torrey Pines State Park just north of San Diego. This tree is the nations rarest pine tree. They grow in near drought conditions, subject to fierce winds and sandy soil, and yet they survive. Their shape tells the story of their existence. This image was captured on our hike through the state park. There were many Torrey Pines that were older, but this one seemed to capture the spirit of survival in adverse conditions. I don’t see many gardenias here in Illinois. When I visited family in Florida a few years ago, the gardenia bush in front of my aunts trailer was in full bloom. Needless to say, I took a lot of pictures. 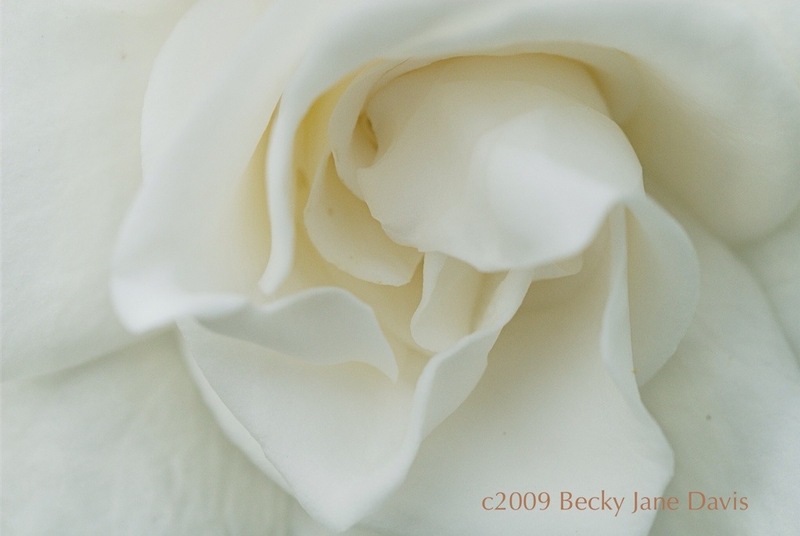 The flowers are so creamy white, with texture and fullness that it was a joy to get up close. I like the almost abstract feel of this image and the way the petals circle around and form a non-pattern of ripples and waves. Looking at this image, I can almost remember the smell as I captured images. This image was in an exhibit in 2009. This is a vacation picture, taken in Missouri at a Bed & Breakfast on a tree farm. I got up early in the morning and loved what the fog did to the landscape. I took a number of images, but this one is my favorite. The tree in the background gives mystery and a feeling of the surreal. The path leading to it beacons you to follow. This image was in the “Life As An Abstract” exhibit at College of DuPage in 2009.